Larger-brain breeds have better short-term memory and self-control than smaller dogs, says a new study. According to research by the University of Arizona (UA), larger-brain canines outperform little dogs on measures of executive functions—a set of cognitive processes necessary for controlling and coordinating other cognitive abilities and behaviors. “The jury is out on why brain size might relate to cognition,” said Daniel Horschler, the study’s lead author, UA anthropology doctoral student, and member of the university’s Arizona Canine Cognition Center. The study’s results are on par with what scientists have previously found to be true in primates—that brain size is associated with executive functioning, but not other types of intelligence. To complete his research, Horschler collected data from science website dognition.com of more than 7,000 purebred domestic dogs within 74 different breeds. 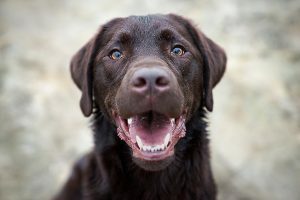 The website offers instructions for dog owners to test their canines’ cognitive abilities through game-based activities and post the data, which can be accessed by researchers. To test a dog’s short-term memory, dog owners hid a treat in view of their dog under one of two overturned plastic cups. Owners then waited 60, 90, 120, or 150 seconds before releasing their dog to get the treat. Smaller dogs had more difficulty remembering where the treat was hidden. To examine self-control, owners placed a treat in front of their seated dog and then forbade the dog from taking it. Owners then either watched the dog, covered their own eyes, or turned away from the dog. Larger-breed dogs typically waited longer to take the forbidden treat. Horschler and his colleagues also found larger-brain breeds performed better regardless of the extent of training they had received. In the future, Horschler says he’d like to do comparative studies of cognitive abilities in different breed varieties.